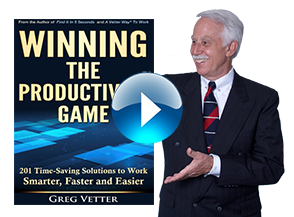 Standardize Your Information | Vetter Productivity, Inc. Think of the many ways a simple task is performed in your organization. Multiply each task by the number of your employees. Many times, that’s the number of different ways the task is being accomplished. Now imagine those tasks being performed the same, efficient way. No down time is wasted trying to figure out how to do them. Everyone using a different system for storing information. Don’t have a good system of how or where to store information that works. Wishing that your department had a standardized information system. You will set up an easy to use, common sense standardized filing system that everyone can use. Your system will be ready to use the very next day. Future employees will be up, running and productive at a much quicker rate due to a preset storage system that they can learn. Locate everything in your shared drive and centralized filing system within sixty seconds. Eliminate time wasting, disorganized and messy filing rooms and shared drives. Identify common tasks and actions and create standardized systems to accomplish them. Enable new employees to be up, running and producing much quicker. Create flow action processes and systems that eliminate common mistakes. The goal is to standardize how information is stored in your organization. That means you and everyone else uses the same system for accessing and storing information everywhere (electronic or paper). Besides having all employees on the same page, future employees will be up, running and productive at a much quicker rate due to a preset information system in place. 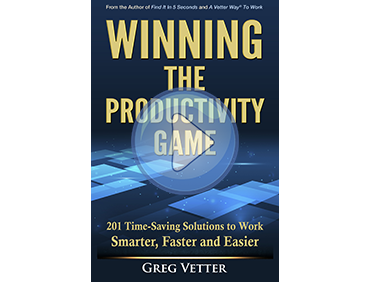 • Greg facilitates an interactive exercise with a select group of your people to determine the Categories that will be used. Time permitting, standardization of other work systems and processes will be discussed and determined during the day. • Also available, A Vetter Way® To Organize Your Shared Drive And Central Files is a group, hands-on day that enables your group to go through, clean out, and set up your new, standardized Shared drive and Central filing system.